Manchester United manager, Jose Mourinho, has continued his war of words with his Chelsea counterpart, Antonio Conte, telling him to stop playing the victim. Conte called Mourinho a “little man” earlier this month, after the United boss brought up his suspension as part of a match-fixing investigation while he was with Juventus. Mourinho then said he had “contempt” for the Italian on Friday, with Conte claiming he was done with the feud. 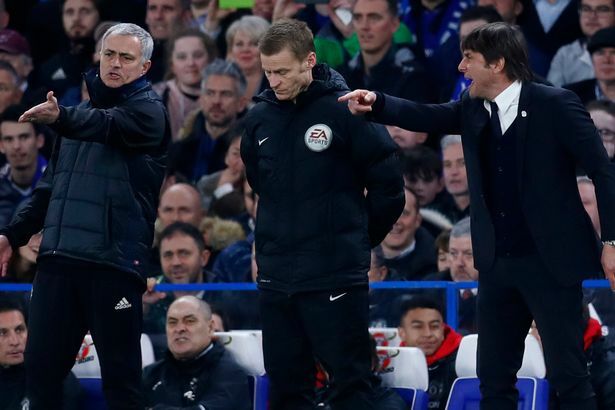 Now, Mourinho aimed another jab at the Italian, claiming on Sunday that he didn’t start the bickering and that Conte should stop acting like he’s the victim. “When I start [feuds] I take the responsibilities of that, and I’ve started [them] many times. “When I don’t start it’s quite funny for me to see other people on the other side acting like victims when they’re not the victims. But, really, I don’t enjoy. That’s why for me it’s over,” the United boss said. Conte had cited Mourinho’s past shots at Claudio Ranieri, before the Portuguese wore a shirt with the former Leicester City boss’ name on it when he was sacked. Mourinho admits that sometimes the feuds are his fault and he never shies away from being the bigger man at such times. “Yeah, sometimes it’s my fault. “Sometimes it’s other managers’ fault. In my case, when I think it’s my fault and I should behave in a different way I’m the first one to apologise, like I did with Ranieri when I had the chance. “That’s when our relations went from bad to good and from good to very good, because I was man enough to apologise,” he added.